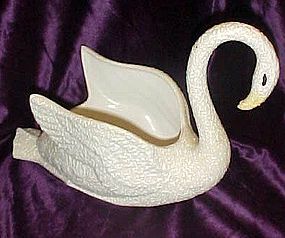 Art Deco Swan Planter Spatter Finish Ceramic, Vintage. To top of neck is 7 1/4" tall and 9 1/2" long. This piece is not marked, but has three "Bars" across the bottom. It is for sure vintage 50's. THe spatter is not just a paint style but actual relief glossy ceramic spatter that has been applied over the initial matte fired body of the swan. It is in excellent condition with not the slightest damage. 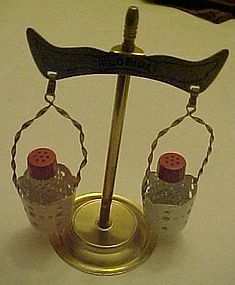 Vintage set of little pattern glass shakers each sit inside a bucket suspended frome balance scales. Buckets have cut-out pattern. Glass shakers have red bakelite caps. Meatal stand Measures 5 3/4" tall, and says FLORIDA. Each shaker is 1 3/4" tall and excellent. No pits or flakes on any of the metal parts. All over excellent condition! 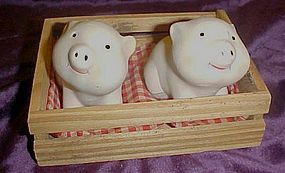 Newer, but cute, unfired (bisque) porcelain pig's salt and pepper shakers sit in a wooden pen. Hand painted and cute. Each pig measures 2 1/8" tall and has their plastic stoppers intact. No chips or damages. Nice condition. These little vintage shakers are different than most of the anthropomorphic grape faces you find. These are each a BUNCH of green grapes and have little hands and feet also. 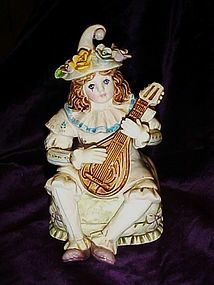 Measure 2 1/2" tall and are made of hand painted ceramic. Original corks and have a black Japan stamp. Excellent condition. 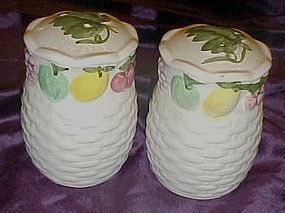 A pretty set of ceramic shakers to decorate your fal harvest decor for Thanksgiving. Glazed ceramic gourd and pumpkin. 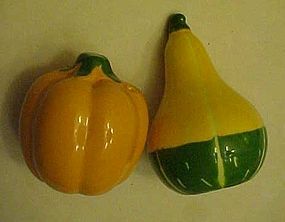 Gourd measures 3 1/2" tall, and pumpkin is 2 1/2"/ Plastic stoppers, and they are perfect and as new. Made by Avon 1984. Take a look at this lovely Monet multi strand necklace. Three strands of Sterling silver chain linked with crystal fireball rondells and large cut glass crystals. 18 1/2" long. Elegant and sparkling! Marked MONET. 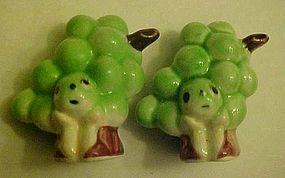 Nice salt and pepper shakers are made od hand paited glazed ceramic. All white with colorful hand painted fruit border at the top. Leaf design at the very tops. Plastic stippers intact. Measures 3 3/4" tall, and there are no chips or cracks. 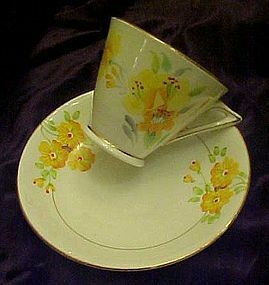 Pretty full size, (not demi) bone china matching cup and saucer made by Royal Vale England. Pretty clusters of burgundy and pink flowers with tan and taupe leaves. Fancy handle and gold trims. Pristine condition and gold is brightand shiny. Cup has a lovely shape. 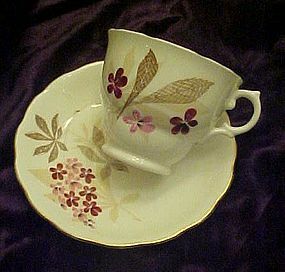 Lovely three piece bone china set consists of a matching teacup, saucer and coffee mug. 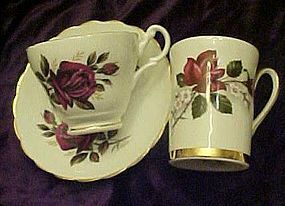 Goregeous burgundy rose motif on each piece with gold trim. all three pieces are in excellent condition with no damages. 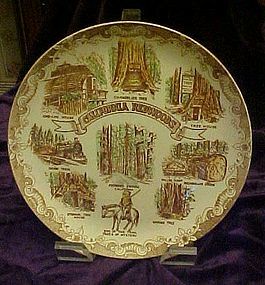 Made by England Bone China, and made in England. A beautiful replacement shade for your special lamp. 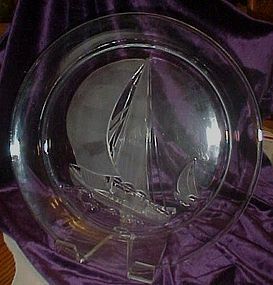 Made of hand blown white (milk glass) with a ruffled top. Outer lustreware finish (irridescent) and airbrushed blue accents with gold trim. 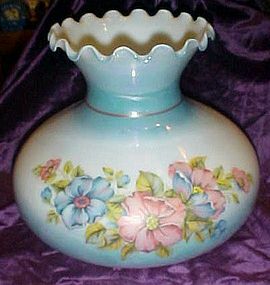 Large front floral display of pink and blue flowers and foliage.Lustre detail is hard to see in the photo. Bottom opening 6 5/8" diameter. Top neck opening is 3" to accomidate a chimney if need be. Perfect with no damages. Measures 8 3/8" tall. 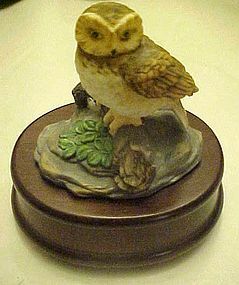 THis lovely porcelain owl sits on a dark finished hardwood base. 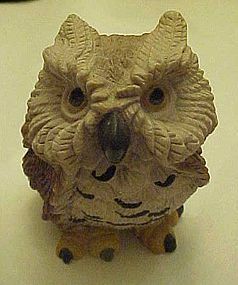 Porcelain owl is hand painted and sculpted in fine detail. No chips or repairs, and the base is perfect and scratch free. Plays a lovely popular tune which I can't name. call me if interested and I can play it for you over the phone. 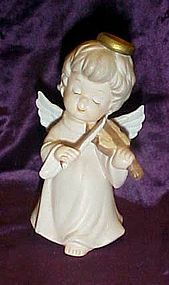 Measures 5 1/4" tall. 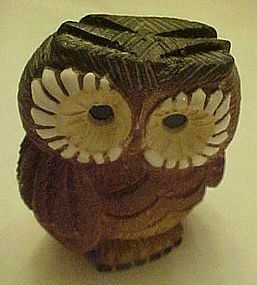 Will make a wonderful gift for the owl lover.Very realistic.